I believe having a reliable and extremely customizable eCommerce Platform like Shopify to set up and manage your online store is the core that you want to build your business success upon, but having the right segmentation and email marketing tool is what it takes to survive in eCommerce. It’s becoming increasingly important to personalize your shopping experience for each of your customers to strengthen your brand image and increase your customer loyalty. That’s why sending the right email marketing to the right shopper is crucial in the coming years. That’s where Revamp CRM can make a different. Real-time Updates: Real-time sync with your customers, orders, products and collections. 360 Contact Profile: Have a 360 Contact Profile for each one of your contacts, including your Contact’s Tickets, Order History, Notes and even Email History. Keep your Data Organized: Use our powerful Tags and Custom Fields to keep your data organized. Slice & Dice Your Data: Export all or part of your Contacts to MailChimp Lists or CSV. Built for Shopify Segmentation: Easily segment your customers based on the last time they bought, how many times they bought, how much they have spent, and much more. Real-time Sync: The Segments you create will remain up to date in real-time so you’re always looking at the right set of customers. eComemrce Filters Built for Shopify: Use our intuitive Powerful eCommerce Filters and set criteria to each of your Segments and Lists. Pre-built Templates: Attractive email templates to help you save your time when sending to your abandoned carts or top customers. eCommerce Best Practices: Pre-built Email Marketing Automation through out your customers’ Lifecycle. Date-based Marketing Automation: A Date-based Automation is based on a specific day or event like customer’s birthday or anniversary. You can set all different sequence of actions, whether it’s sending email, create task, add to list or change score we will do it for you. Standard Marketing Automation: A standard Automation is based on a series of actions – whether it’s send email, create task, add to list or change score – which you can manage by setting time delays between these actions. Email Personalization: Our built-in shortcodes to help you personalize each email to increase your email marketing ROI, without having to know code! Abandoned Cart Insights: Have the best available analytics on your abandoned cart rate, value and products. 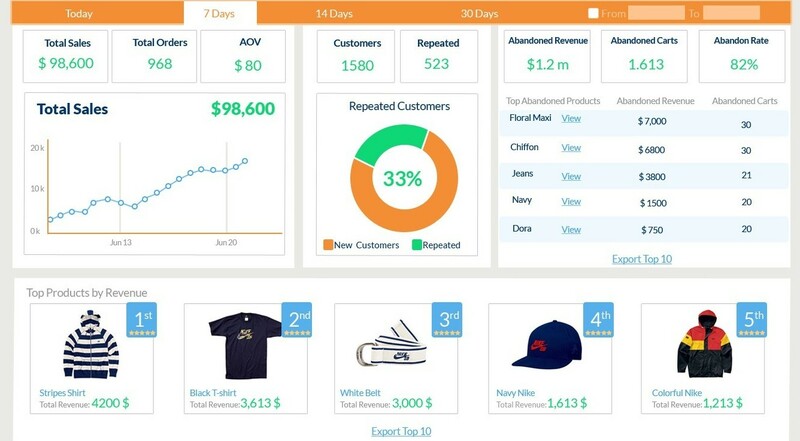 Store Dashboard: Evaluate performance of your products and understand your orders value, AOV and other metrics to help you make the best decisions for your business.